The other spot cards laughed at the little six’s “Ah shucks” demeanor. “It’s so exciting I’m gonna need another beer soon,” the Five of Hearts yelled, causing an outbreak of laughter from the attentive crowd. For after all, it had only been twenty seconds or so since this fine spot card had refreshed his mug. “Surely he must come from a family of rocket scientists,” the Three of Diamonds said. “Or maybe his daddy solved three dimensional sudoku puzzles while waiting in a checkout line,” the Deuce of Spades said. “Let’s drink to smart declarers!” the Four of Diamonds yelled and this caused a rush to the bar and made the Six of Clubs temporarily suspend the spinning of his tale. “Lead a spade, lead a spade,” the tipsy Seven, Six, Five, Four, Three, and Deuce of Spades chanted. The crowd cheered wildly and when the patrons later voted, the Six of Clubs won the big prize, which was three evenings of free beer. Everyone cheered the valiant six, and to show he was a good sport, he gave his first free beer to the Five of Clubs. After that, it was a memorable and merry night at the Sevens and Under Public House. 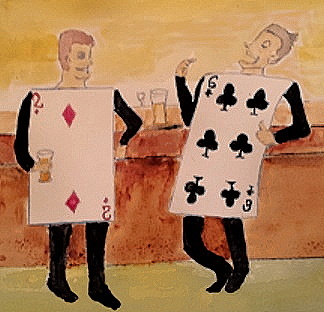 This entry was posted in bridge friends, Bridge Hands, Bridge Humor, Bridge Rivalries, Fiction, Humor, Stories, Uncategorized and tagged Bridge, bridge buffs, Bridge Club, Bridge humor, bridge rivalry, duplicate Bridge, Sevens and Under Public House, six of clubs, The Six of Clubs Wins Free Beer. Bookmark the permalink.